On the twenty-first of this month [July], we commemorate our Holy Fathers Symeon the Fool for Christ and John. In solitude laboring the passions of the flesh. Feigning non-sensibility the sensible Symeon died on the twenty-first. These Saints were from Edessa which is in Syria, and flourished during the reign of Emperor Justin I (518-527). At one time they went to Jerusalem, to see and venerate at the Exaltation of the Honorable Cross. Afterwards they did not return to their homeland, but arrived at the Monastery of Saint Gerasimos of Jordan, where they were favorably received by the then God-bearing Abbot, whose name was Nikon. There they received the holy schema of monastics. 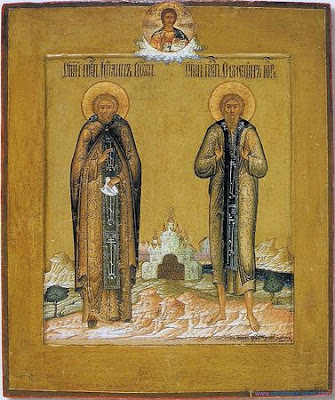 Before their seven days were completed, which is customarily kept by newly-tonsured monastics, during which time they remain within the Monastery, they departed the Monastery and went into the desert, and they dwelled there for forty years, undertaking all forms of asceticism and hardship. 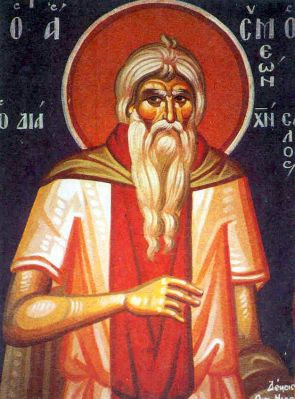 Though John remained in the desert until the end of his life, Symeon returned to Jerusalem, and after venerating the Life-bearing Tomb of the Lord, he prayed that the people of the world would not understand his secret labor of foolishness, which he considered undertaking as long as he was in this present life. He therefore went to the city of Emesa, and appeared to be stupid and foolish, and with this apparent stupidity worked many miracles, which, when they took place, only those who were wise and of a sharp mind recognized. When this renowned man departed to the Lord, these things came to be known by all. For one person narrated a miracle that took place through the Saint, while another person narrated another, and so on. These things became commonly known for the benefit and learning of all. We will not mention here all the miracles the Saint worked, since they can be found at length in his Life, but we do need to narrate one of his later miracles. When the Saint reposed, two men lifted up his relic, without having been cleaned, cared for, chanted over or censed, and they brought it to the cemetery to be buried. As they were passing by the house of a Hebrew, the relic of the Saint appeared to be much praised and glorified by a crowd of people, with sweet melodious chants, so that when the Hebrew heard these, he leaned out of his house to see, but he only saw those two men who carried the relic, which moved him to say: "Blessed are you, O fool, for although you had no man to chant for you, you have Angels to honor you with their angelic hymns." He therefore left his house and went to bury the body of the Saint with his own hands. When these days had passed, John his fellow ascetic came, and he found that he had departed to the Lord. Venerable John and divine Symeon, united to God and united in soul to one another: one of you lived an inspired life in the desert, and the other by his foolishness made a fool of Belial. Now you are rejoicing in heavenly glory: ever watch over us. Let us praise angelic and God-bearing Symeon, who in the flesh appeared fleshless and shone with virtues; and with him let us praise glorious John, for they ever intercede with Christ our God for us all.